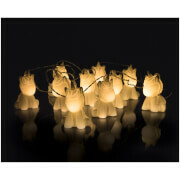 The Solar System String Lights are the perfect lighting accessory for anyone fascinated by the planets. The 2m long set of string lights feature the ten planets from our solar system and are even placed in order from the sun. Powered with energy efficient, long-lasting LEDs, the lights will add an ambient glow to a bedroom at any time of day and are also suitable for use as a night light.